University of Texas Rio Grande Valley head men's basketball coach Lew Hill gives instruction during a non conference game against Bethune-Cookman at University of Texas Rio Grande Valley on Monday, November 13, 2017, in Edinburg. EDINBURG — The Gazelle Group’s Ray Cella begins reaching out to schools about participating in the CBI about a month before the brackets are announced on Selection Sunday. Typically, the response from the programs is 50-50. Some are content to let their season end, while others want the opportunity to continue playing. 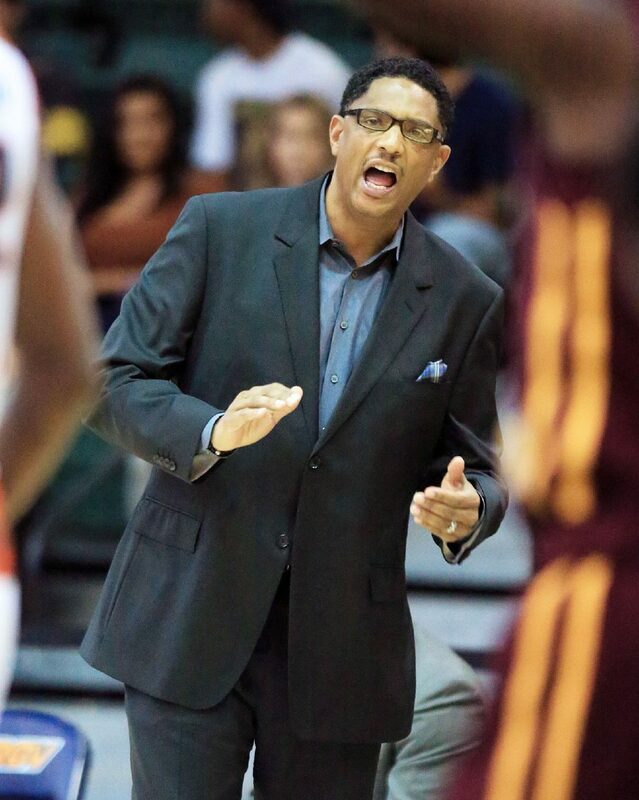 When he looked at UTRGV, he saw a team that had won more games than in any season since 2012-13 and was on the rise under second-year coach Lew Hill. UTRGV is 15-17 and ranks No. 229 in RPI, but perhaps more importantly, the Vaqueros wanted to the chance to participate. UTRGV will face New Orleans on the road at 7 p.m. Wednesday in the opening round of the College Basketball Invitational, a 16-team tournament produced by the Gazelle Group. For UTRGV, the event is an opportunity to raise the program’s profile, reward the current roster and gain a new selling point for the next generation of recruits. The program hasn’t participated in a men’s basketball postseason tournament since advancing to the NIT following the 1980-81 season. When Hill took the helm at UTRGV prior to last season, he often talked about bringing the program along in baby steps — having to crawl before you can walk. The ultimate goal every season is to win the WAC Tournament and advance to the NCAA Tournament, and UTRGV athletics director Chris King said the CBI can be another step on the path to that accomplishment. The CBI is entering its 11th year, and 26 teams that have participated in the event went on to reach the NCAA Tournament the next season. VCU won the 2010 CBI before reaching the NCAA Tournament Final Four in 2011, and Nevada won the 2016 CBI before advancing to the NCAA Tournament as the Mountain West Champion last year and as an at-large selection this year. Cella said the athletics director at 2015 CBI champion Loyola Chicago reached out to him after the program won the Missouri Valley Conference Tournament last week to express gratitude that the current seniors went through the CBI experience as freshmen. King said UTRGV was in regular communication with the CBI during the selection process, and he believes the program became an appealing option because of its style of play, upward trajectory and strength of schedule, including nonconference matchups against Texas A&M, SMU, Oklahoma State and Georgia Tech. The WAC was also a boon, as the league ranks 14th out of 32 NCAA Division I leagues in conference RPI. CBI road teams do not pay an entry fee and have their travel expenses covered by the tournament, King and Cella said, and UTRGV is guaranteed to not play a home game unless it advances to the best-of-three final. In the process of securing the CBI berth, UTRGV agreed to play in a tournament the Gazelle Group is producing at Baylor in 2020. All in all, King and Hill both said pursuing the opportunity to participate in the CBI was a no-brainer for the program.